Horizontal separation offers many advantages over traditional fixed-angle separations, including tighter straight-line gel separations to reduce re-spins and re-mixes. The ComboXL centrifuge spins test tubes from 3ml to 15ml, and even 50ml, at speeds up to 4,000 rpm, with microprocessor speed control. 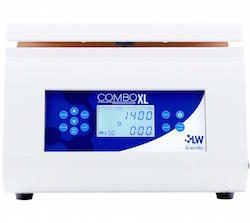 Simply program the digital time and speed and the ComboXL centrifuge will lock the lid and spin the load. G-forces up to 2,683g’s will produce serum in minutes, or reduce the speed for urine sediment and other separations. The zero-rpm interlocking metal lid will stay locked until the rotor has come to a stop, to ensure safety. The all-metal rotor buckets are built for strength and durability, and the wide-mouth metal bowl allows for easy cleanup. The whisper-quiet heavy-duty brushless DC motor can handle high volume use and high-speed full loads for years to come.